in the country, and its magnitude amazed practical railroad men everywhere." Fall Brook Coal Company Locomotive #45 "Mulhollon"
After a foreclosure sale in 1854, Hon. John Magee purchased a controlling interest in the Corning & Blossburg Railroad in New York State, beginning a series of acquisitions and leases which led to the formation in 1892, of the Fall Brook Railway and its ultimate merger into the New York Central system. Mr. Magee, my great-great-granduncle, was a former two-term member of Congress whose extensive businesses included stage coaches, mining and the Fall Brook Coal Company, which operated mines at Antrim, Blossburg and Fall Brook, PA. In 1833, The Tioga Navigation Company (PA), and the Tioga Railroad (NY) were given permission to construct a rail system to carry coal and lumber from Blossburg, PA north to Corning, NY. Each state would only allow rails to be built to their respective state line; the New York section later became the Corning & Blossburg. At Corning, coal and lumber arriving by the Tioga, was loaded onto canal boats which took a circuitous route via the Chemung Canal extension to Horseheads, NY. From there, it went by the Chemung Canal to Watkins, to be loaded on larger craft, and taken north on Seneca Lake, to be marketed. When it commenced initial operation in 1840, this was one of "the oldest railroads in the U.S., built expressly to carry coal." Together, the continuous line from Blossburg to Corning totalled 46+ miles. The combined railroad was leased to the Tioga Railroad Company. In 1852, the Tioga Railroad built a line from Blossburg to the coal mines at Morris Run. The New York section of the road, extending from Corning to Lawrenceville, fell into debt, and was purchased by John Magee, who reorganized the rail line as Blossburg & Corning (B&C). He made major improvements to the track and the facilities (including making the track gauge a standard 6 feet, allowing the Tioga to connect to the Erie Railroad at Corning), and convinced the owners of the Pennsylvania section, the Tioga Railroad Company, to do the same. The B&C owned the rail line only; all equipment and rolling stock was owned by the Fall Brook Coal Co. In 1869, the line was leased to the Fall Brook Coal Co. 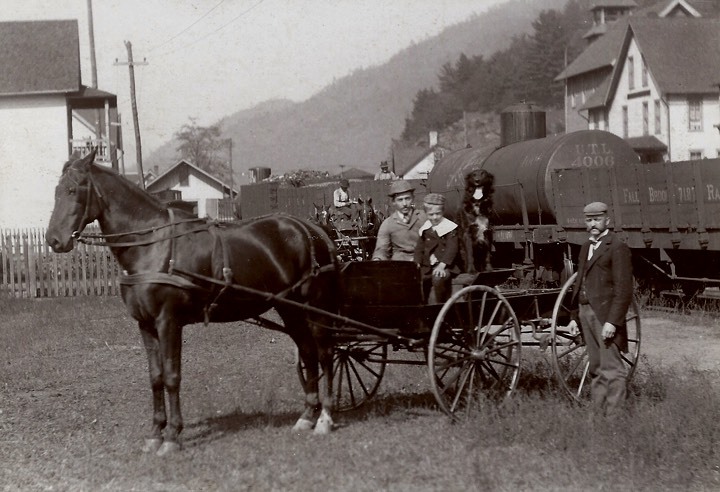 Under the direction of Humphries Brewer, working for John Magee, a large vein of coal was found in Fall Brook, PA. John Magee's Fall Brook Coal Company built seven miles of railroad from Fall Brook to connect to rails in Blossburg. That line, called the "Fall Brook Railroad" was completed in 1859, and Fall Brook, itself, became a busy mining town, with dwellings, school, churches, sawmills, blacksmith and chutes for handling coal. By 1865, there was a Fall Brook Hotel. Following John Magee's death in 1868, and the death of his son, and successor, Duncan Magee, in 1869, George J. Magee, another son, took over the interests. He was instrumental in building, in 1870, an extension of the Wellsboro & Lawrenceville Railroad to the mines at Antrim, PA.; that line was leased to the Fall Brook company. 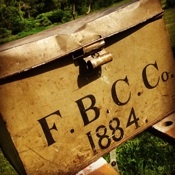 In addition to the Blossburg & Corning and Wellsboro & Lawrenceville (which were merged in 1874), the Fall Brook company also leased rights over the Cowanesque Valley R.R., running west from Lawrenceville, which had been completed in 1873. By exchange of stock, These were all folded into the Corning, Cowanesque and Antrim R. R. (C. C. & A.) by the end of 1874, which was controlled by the Fall Brook interests. Though extending south into Antrim, PA, the Magee leased rails went only as far north as Corning, NY. Coal from the mines travelled over the Erie, Tioga, and Northern Central Railroad tracks, in addition to the lines controlled by Fall Brook Coal, to reach markets. As tariffs for transportation on the tracks of others' roads became more onerous, Geo. J. Magee sought to establish a railroad from Corning to Geneva, which he could control. He made an arrangement for a bond swap with the insolvent Sodus Bay and Corning Railroad, which had begun to survey such route. He would take over the route, paying current bondholders in stock in his new road, to be known as the Syracuse, Geneva and Corning R. R. (S. G. & C.) When his original contractors failed, President George J. Magee pledged the entire Fall Brook Coal Company, and his own personal wealth, apparently against unanimous advice to the contrary, and jeers from the press, to complete the line. In addition, Magee promised the new corporation to furnish it coal traffic sufficient for the payment of the interest upon its first mortgage bonds and for a sinking fund. The S. G. & C., which had been met with derision by the newspapers - and apparently everybody else - in Geneva, NY, was hailed as soon as it opened in 1877 as a brilliant business decision by George Magee. All Fall Brook tracks were narrowed to "standard gauge," to match those of the New York Central. Finally, it would be possible to load a car of coal in Blossburg and deliver it to the Erie Canal, or connect at Geneva with the Auburn Road of the New York Central. 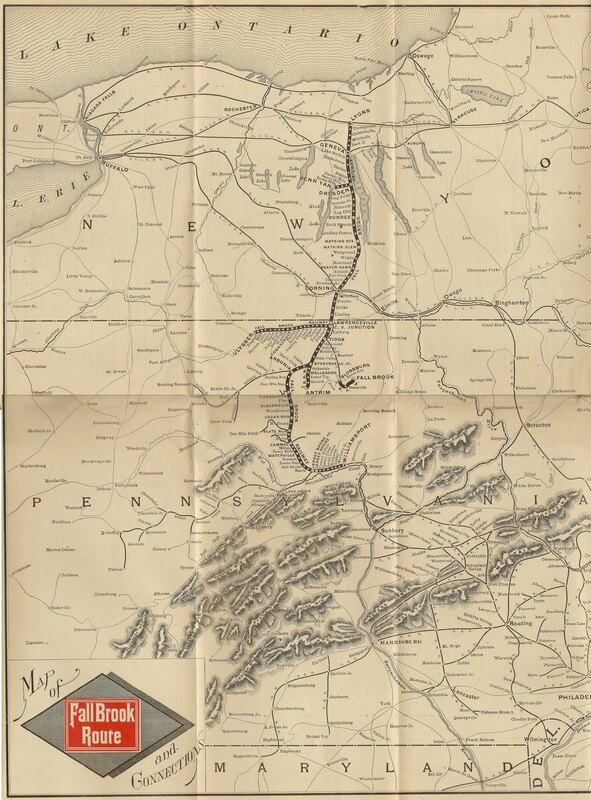 Shortly, a link from Geneva to Lyons (Geneva and Lyons R. R.) was constructed by the Vanderbilt's New York Central and Hudson River (N. Y. C. & H. R.) and leased to the Fall Brook Co., completing the connection from northern PA coal fields to New York Central mainline tracks along Lake Ontario. It is evident throughout that the Fall Brook was coordinating its interests with the Vanderbilt-controlled N. Y. C. & H. R.
At the same time that coal findings along the Fall Brook began to thin, and labor problems began, demand exploded for coal to fuel industrial expansion (as well as locomotives). In 1882, Cornelius Vanderbilt and a coalition acquired 22,000 acres of rich coal land in Clearfield and Centre counties (PA). They needed to develop a way to get this coal (in an area controlled by their rival, the Pennsylvania Railroad System) to their mainline in upper New York State. 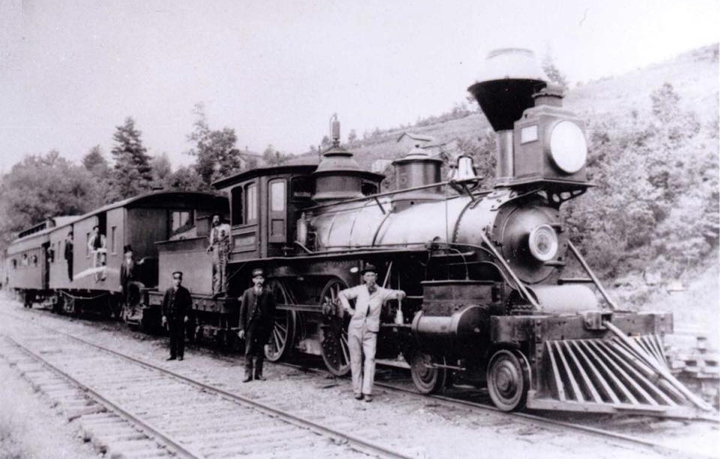 Vanderbilt gained control of the Jersey Shore, Pine Creek and Buffalo Railway Co. with connection to the Beech Creek and Reading Railroad. The name was later changed to Pine Creek Railway Co. and leased to Fall Brook by the N. Y. C. & H. R. These connected with the Fall Brook interests at Stokesdale, PA, thus creating a contiguous track from the new mines in Pennsylvania to the N. Y. C. & H. R. mainline at Lyons, NY. A system map and timeline may help to illustrate this history. The leased railroads owned no locomotives or rolling stock; everything was owned by the Fall Brook Coal Co. [see map] To give an idea of the scope of the Fall Brook rail operations: in 1887 there were: 1,424 employees; more than 250 miles of track operated and used by the company; 57 locomotives and 2,543 cars, freight and passenger. 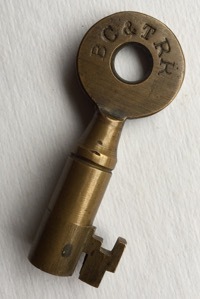 In 1892, the coal and railroad operations of the Fall Brook Coal Company were split, with all the rail operations transferred to the newly named Fall Brook Railway Co. which included leases of the Geneva & Lyons; Syracuse, Geneva and Corning; Corning, Cowanesque and Antrim; Fall Brook, and Pine Creek Railways. By 1893, that system owned 74 locomotives and 3,469 cars (of which 25 were passenger cars). Throughout, the Magee family directed the operations of the Fall Brook: initially, Hon. John Magee (1794-1868) who was followed in 1868 by his son Duncan (who passed away in 1869 after only a year as president). John's son General George J. Magee (1840-1897) succeeded - amazing as he was only 29 - and was responsible for the explosive growth and consolidation of the rail operations. Upon George's death in 1897, his son Col. John Magee took over. Following intense pressure from the Vanderbilts, labor unrest, a number of wrecks and other incidents, John was instrumental in the ultimate lease to the Vanderbilt's N. Y. C. & H. R. in 1899. The N.Y.C. & H.R. purchased all interests in 1909 and consolidated them to form the Geneva, Corning and Southern Railroad Company which, in 1914 became the "Fall Brook Division" of the newly inaugurated "New York Central System." This site contains a brief glimpse of the Fall Brook Coal Company and its railway interests, with suggestions of further resources for anyone wanting to learn more. In addition, we have created an archive of original news articles, and excerpts, from local papers. And it is a way for our family to remember this colorful part of our history. We continue to add relevant materials as they are found. Today, the Wellsboro & Corning Railroad (acquired by the Genesee & Wyoming in 2012) actively operates on a portion of the original Fall Brook roadway from Wellsboro, PA to near Corning, NY. The Tioga Central Railroad operates excursion and charter trains along a portion of that roadway. PS - My great-grandfather, Daniel Beach, Esq., having had the good sense to marry Hon. John Magee's niece, Angelica, was at various times Treasurer, General Counsel and Vice-President of the Fall Brook interests. The "News Archives" are continually being updated with contemporaneous reporting on the railroad through fifty years. While it has grown a bit unwieldy, it provides a fascinating look into 19th Century railroading. NOTE - We actively seek historical material for this site. If you have any information, photos, etc., of the pre-1900 Fall Brook interests, which would help illuminate this site, we would love to include them. Photos and scans of relevant materials are greatly appreciated. If used on this site, you will be appropriately credited, and will be rewarded with one of the Fall Brook Route coffee mugs.